You know you want it. Come on, you really do. All those hours spent playing Harvest Moon, wishing it were just the teensiest bit more realistic. And let's be honest, your most impressive Minecraft map is basically an automated wheat-producing machine. Time to drop the act and pick up a real man's farming game: Farming Simulator 2013. And we're only slightly joking when we make that statement. 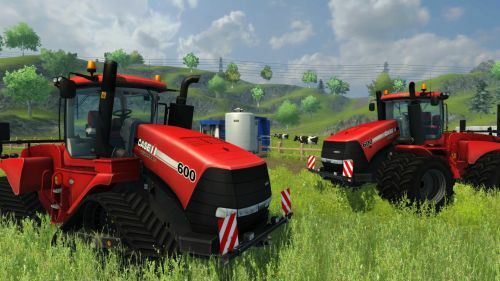 This fall will mark the EU console debut of Farming Simulator 2013, sporting both Xbox 360 and PlayStation 3 releases set for the first week of the September. You know, because harvest season and all. The new release will double the amount of land you can farm, adding a little continent known as North America along with new barns, new vehicles, new types of land, and tools that allow you to create and share mods and equipment online. That, plus 10 player online co-op farming pretty much seals the deal in our eyes. Check out our Farming Simulator 2013 co-op review for the full scoop on the PC version of the game.